Hello everyone: I have another TWOFER to share today, I'm really having fun with this challenge. I decided to make a couple of masculine cards, I realized I only have like 3 in my stash and that is bad, I think I don't often make this type of cards because guy cards are hard for me to create and that is why I'm so happy to own the retired "Wetlands" stamp set by Stampin' Up!, which is just perfect for masculine cards, all the images and the sentiments are beautiful and not girly at all. 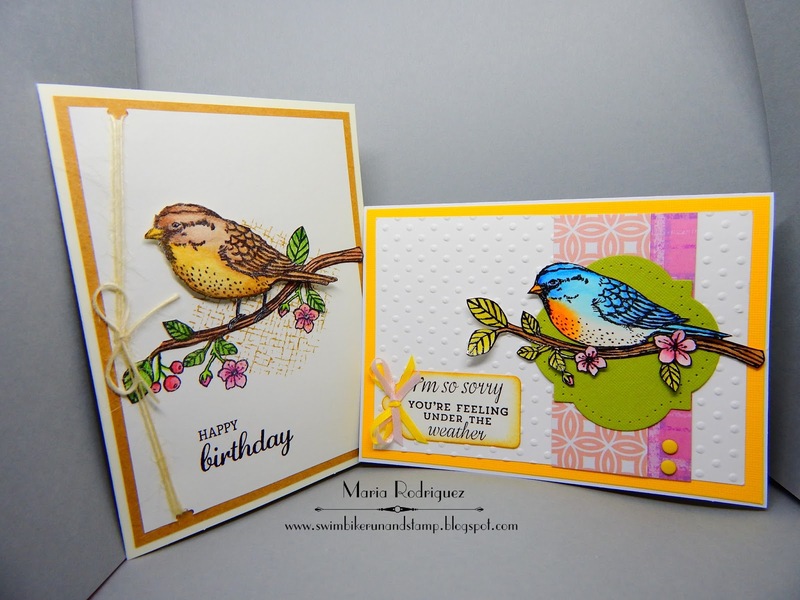 Simple and with few embellishments, I'm very happy with the way these two cards came out. 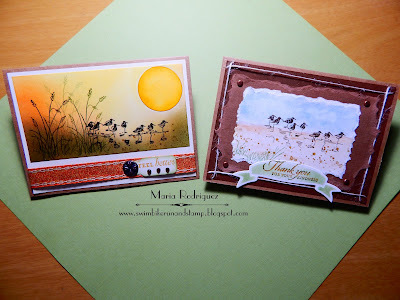 With a bit of sponging on the left card and some watercolors on the right card, I was able to create two different scenes using the same image of this cute Sandpipers. I took the pictures of the cards together on top of my work desk, they don't fit in the little cube I use all the time to photograph them. Here are the individual shots. 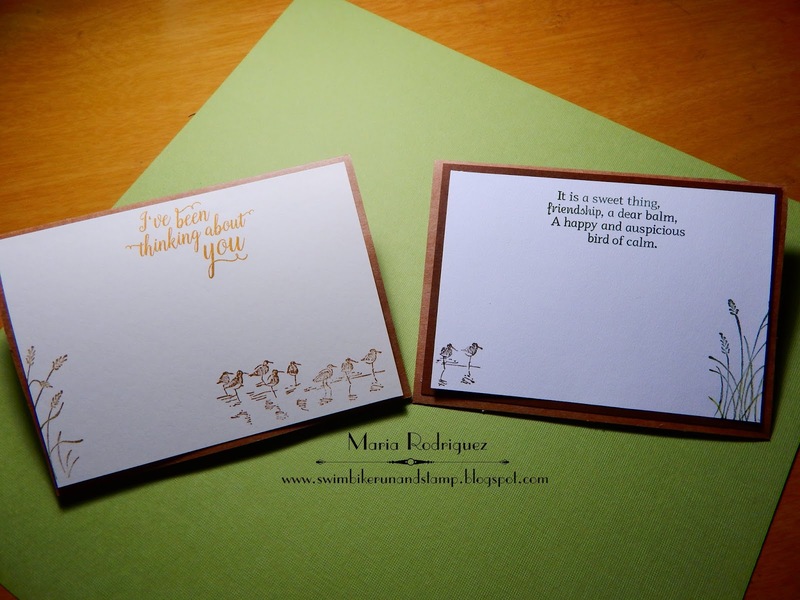 Here is the picture of the inside of both cards, finishing the inside saves me time when I mail them. 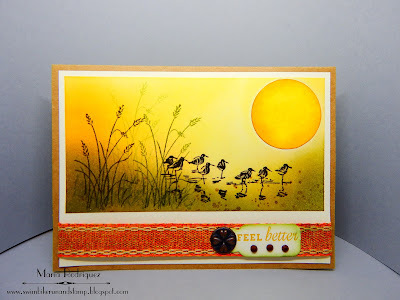 The sentiment on the right card is from a retired Flourishes set called "Gerbera Daisies"
Oddball Art Stamps Blog Challenge January "Feature a Creature"
DL.ART Challenge #220 "Winter" optional theme "Thank You"
Crafty Animals Challenge #10 "Anything Goes"
Hello dear blog friends: Here is another card I made to play along with the Power Poppy January Challenge which is providing 10 fabulous sketches for us to play with, this is my third entry to this challenge, I'll also link this card to a few more challenges at the end of this post. This image is from a Power Poppy set called FARMERS MARKET, I just love all the delicious, fresh and beautiful veggies in this set. 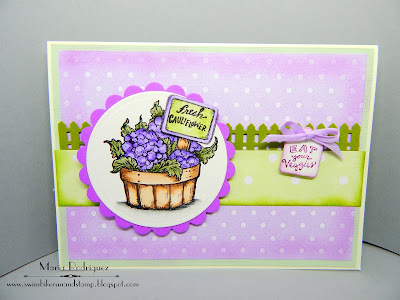 I stamped my gorgeous purple cauliflower on a die cut piece of watercolor paper with Stazon black in and colored it with my Sakura Koi watercolors. The little sentiment on the tag is from the set, the patter papers are from a discontinued line from Lili of the Valley, the fence was punched with a Martha Stewart punch. Finishing the inside of my cards saves time when I mail them and they give the recipient something pretty to look at when they open the card. Both the sentiment and the apples are from the set. This is the sketch I used from their Card Maps, this is the one I used. Craft-Dee BowZ Anything goes with a handmade bow, mine is tiny but it's there. 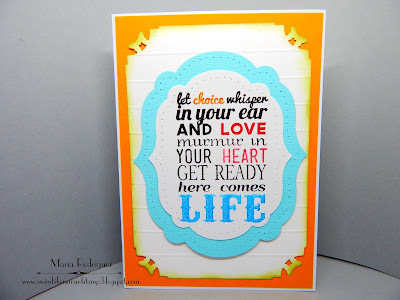 One Crazy Stamper Anything goes with a twist, add purple or blue and a ribbon or button. Hello everyone: I hope your Holidays were filled with Joy and Peace, family and friends and, of course, lots of goodies, from my family to yours, we wish you a fabulous 2018!!!!! So here we are, launching a brand new challenge for you to have fun with and the theme is "WHITE ON WHITE", and like the banner says, you can use a neutral color. So here's my card and I hope it inspires you to come play along with my teammates and me in the RETRO RUBBER gallery. 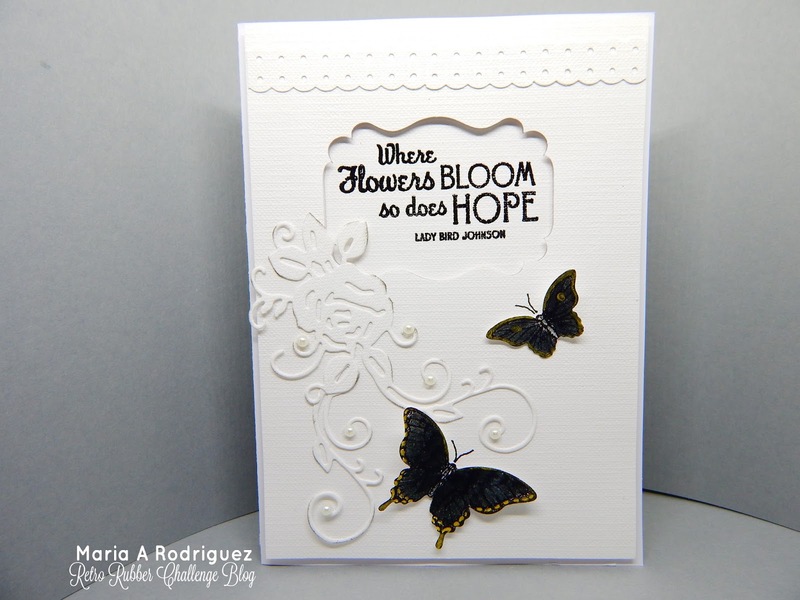 This card came together really quickly, I had the two butterflies, from the retired Stampin' Up! set "Papillon Potpourri"(2012-2013 Idea Book and Catalog) already stamped and punched, all I did to them was to color the wings black with a Prismacolor Pencil and a paper stump dipped in Gamsol and a bit of gold to them, I punched the main panel with a label punch and die cut the flower with an old die that I think comes from Elizabeth Craft Designs, but I'm not to sure, the detail on top was punched with the retired SU Dotted Scalloped Border Punch and finally, I added a few small pearls to the flourishes on the flower. 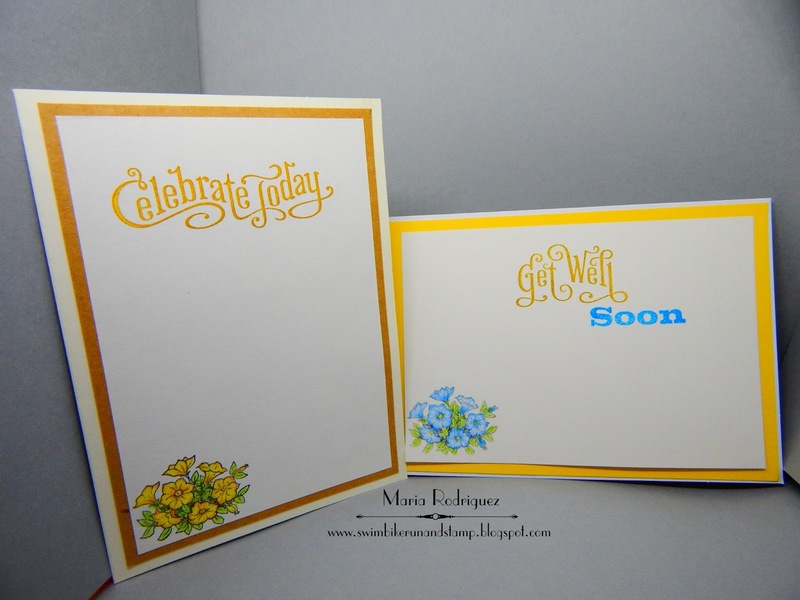 The sentiment is from a retired Flourishes set called "Tulips for Friends" that dates from March of 2013. I started finishing the inside of my cards at the beginning of last year, it saves me lots of time when I mail them, here's a picture of the inside of my card. 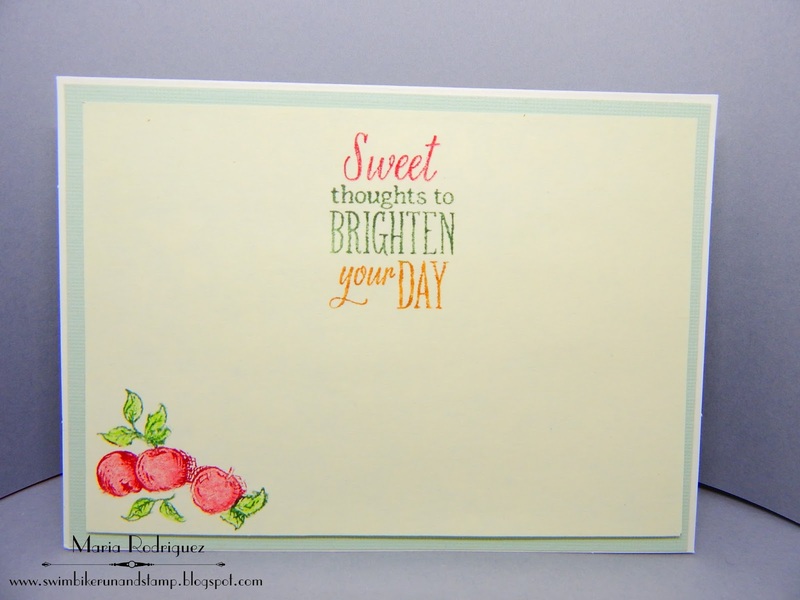 The sentiment is from another discontinued set from Flourishes called "Magnolias" that dates back from 2012. 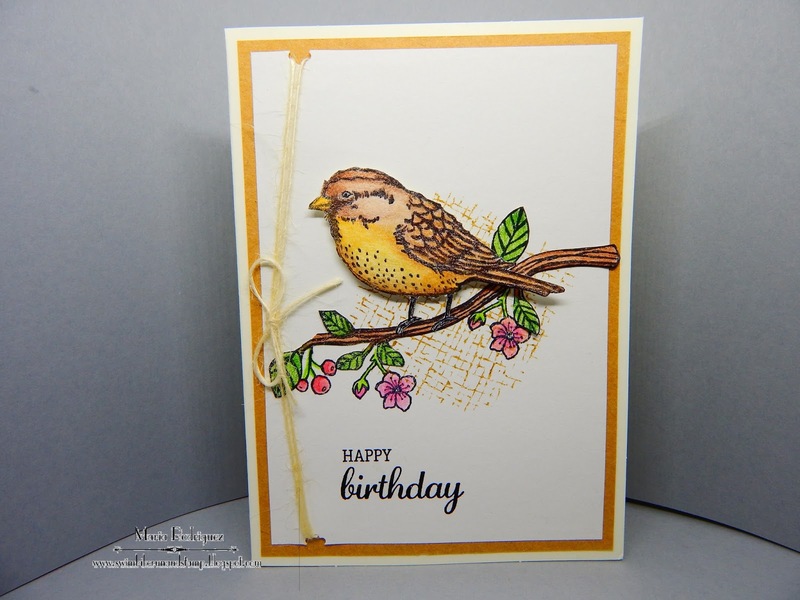 I stamped it and then die cut it with one of the dies from a Spellbinders set called "Oval Regalia". So there you have it, the first RETRO RUBBER Challenge of 2018, I hope my card inspires you to come and play along with my teammates and me in our gallery. 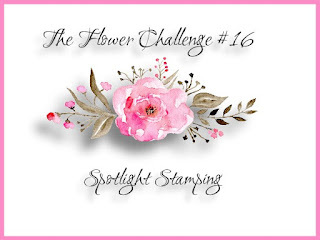 Please remember to read our rules, one of them is that, at least one of the rubber stamps you use, needs to be older than one year, this challenge blog is dedicated to using our old and sometimes forgotten stamp sets, so lets give them a chance to get inked up and be useful again. 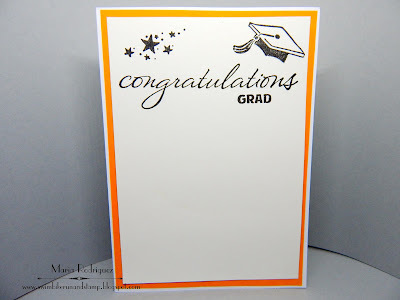 Hello Blogging friends: Lets get SENTIMENTAL, shall we? The SHOPPING OUR STASH has a new challenge for you to play with this week, we want you to make your SENTIMENT the focal point on your card so, here is the card I made that I hope will inspire you to come and play along. When I go to the craft stores for supplies, I always take a peek at the bargain/clearance section before I leave the store and, more often than not, I find really great stuff, from stamps to ink, paper, etc. and this stamp set is one of those great finds. 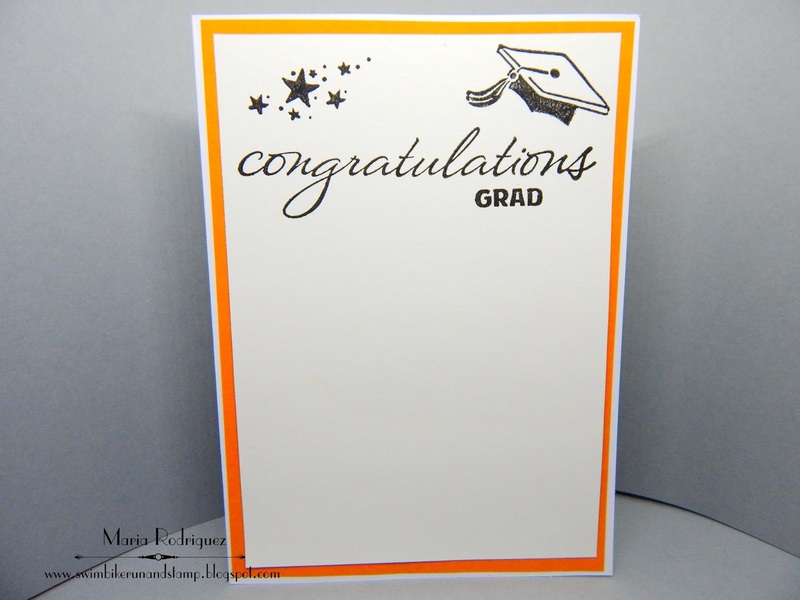 It's from Penny Black and it's called "Life Messages", this one I think, it's perfect for a soon to be Graduate. I stamped this beautiful sentiment using my MISTI, I don't think I would have been able to highlight the words any other way. I used my SU markers and Versafine black ink. I always finish the inside of my cards, saves me time when mailing them. All of the images are from a Friskars stamp set also found in the bargain section. 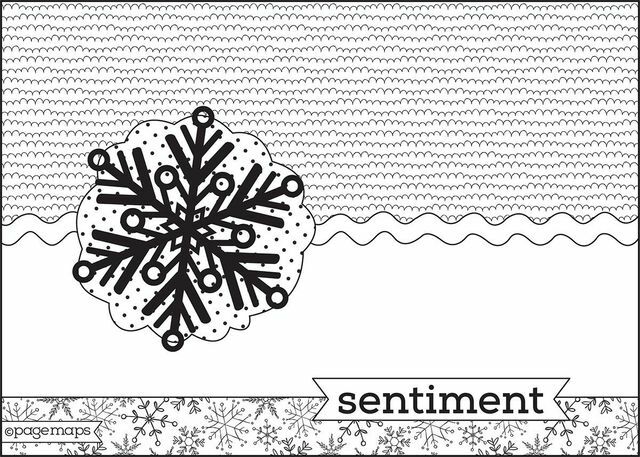 I hope you go dig out your sentiment stamps and come and play with us at the SHOPPING OUR STASH gallery, we can't wait to see what you create. 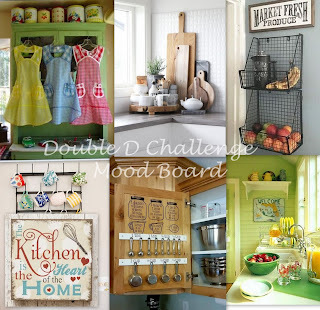 Stop by my teammates blogs to see their beautiful creations, get more inspired and join us. Hello again everyone: We are at the half way point at THE FLOWER CHALLENGE, where we are doing a fun technique called "Spotlight Stamping", this means that you stamp your flower image and just color certain spots on it. 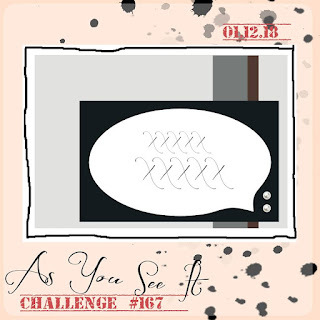 Maybe you'll color a vertical strip or a circle or just go around the image and color small parts of it so, we hope you give this challenge a try and share your creations in our gallery. Here is my card that I hope will inspire you to play along. 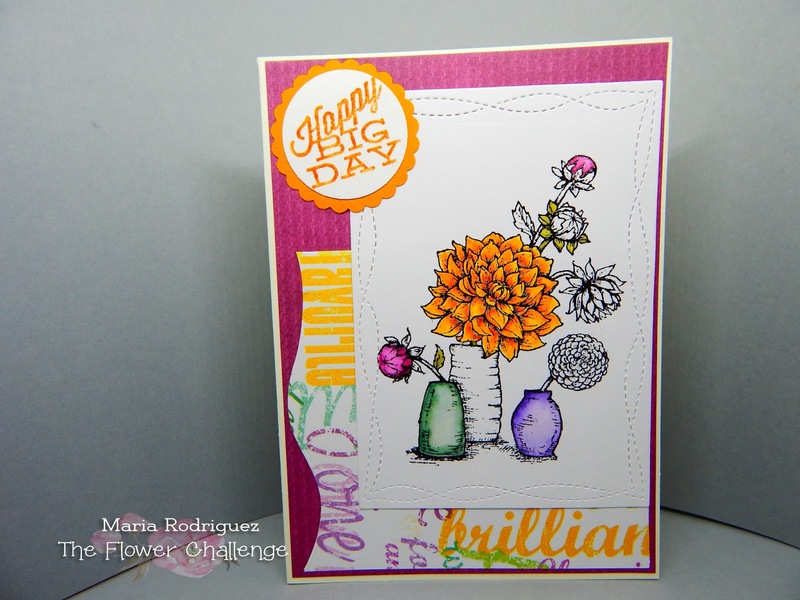 I stamped this image from an old Flourishes set called "Dahlias" on a die cut piece of watercolor paper with Versafine black ink and clear heat emboss it then, just color a few parts of it with SU markers and ink pads, the sentiment is from this set. The pattern paper in the background is from Lili of the Valley (retired) and from an old pad from the craft store. I must confess I had to stop myself from coloring the entire image, LOL!! Finishing the inside of my cards is fun and saves me a lot of time when mailing them. The sentiment and cute little party horn are from a Power Poppy set called Marcella's Mixed Tape Volume 1, it has a lot of really fun images. The little party horn was colored with Prismacolor pencils and a paper stump dipped in Gamsol. I used to use baby oil but the Gamsol is so much better. I hope you find some inspiration in my card, for even more inspiration please visit THE FLOWER CHALLENGE blog and checkout my teammates fabulous creations. While you are there, visit their blogs and leave them some comment love. 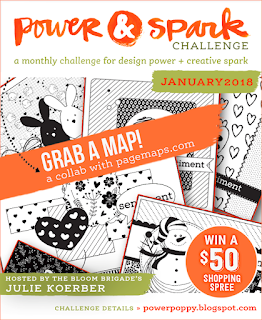 Please don't forget to read and follow our rules and also, please include our banner for this challenge on your blog post when you upload your cards to the gallery. HELLO BLOGGING FRIENDS: I'VE BEEN HAVING TROUBLE WITH MY COMMENT SECTION FOR A WHILE NOW, SOME OF MY FRIENDS HAVE HAD A HARD TIME PUBLISHING THEIR COMMENTS AND THAT IS JUST TERRIBLE. MY FRIEND LESLIE MILLER FROM RUNNING WITH SCISSORS SUGGESTED TO CHANGE THE COMMENT FORMAT FROM "EMBEDDED" TO "POP WINDOW" SO THAT'S WHAT I DID, I TRULY HOPE THIS WILL MAKE IT EASIER ON YOU TO VISIT AND LEAVE ME YOUR SWEET COMMENTS, THANK YOU!! 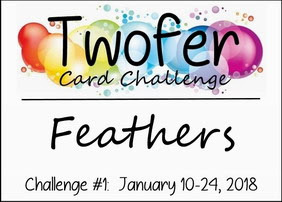 Hello dear blog friends: I don't know if you know that there is a new challenge out there in Blog Land, this one was created by Darnell Knauss and it's called Twofer Card Challenge. 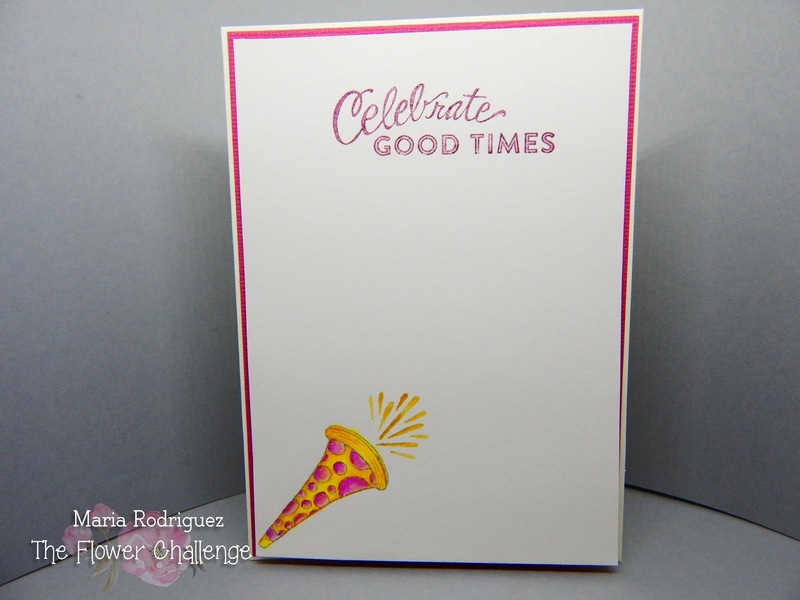 The purpose of this challenge is to create two totally different cards using the same stamp set, the occasion has to be different too, Darnell has easy to follow rules for this first Twofer Challenge. It was a bit tricky to fit both of the cards inside my little cube so I think I'm going to have to think of a better way to do it for when I play again next time. 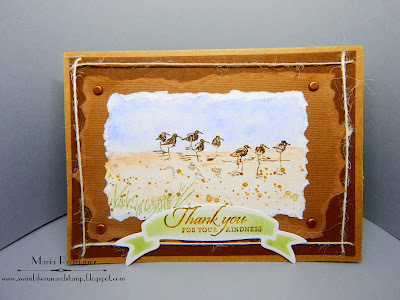 The fabulous image is from a retired Stampin' Up! set called "Best Birds" and I really love it. 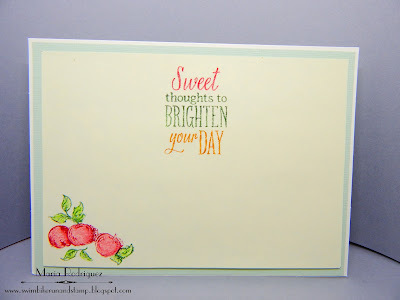 All the images were stamped on Strathmore watercolor paper with Stazon black ink for the left side card and with Versafine black ink (clear heat embossed) for the one on the right side, colored with SU markers and Prismacolor pencils and then fussy cut. The sentiment on the left side card is from the "Best Birds" set and the one on the right side is from Power Poppy Daffodils, I actually combined 2 sentiments from this same set. And here's the picture of the insides of both my cards. Finishing the cards this way saves me time when I mail them, I think they look really pretty and finished. 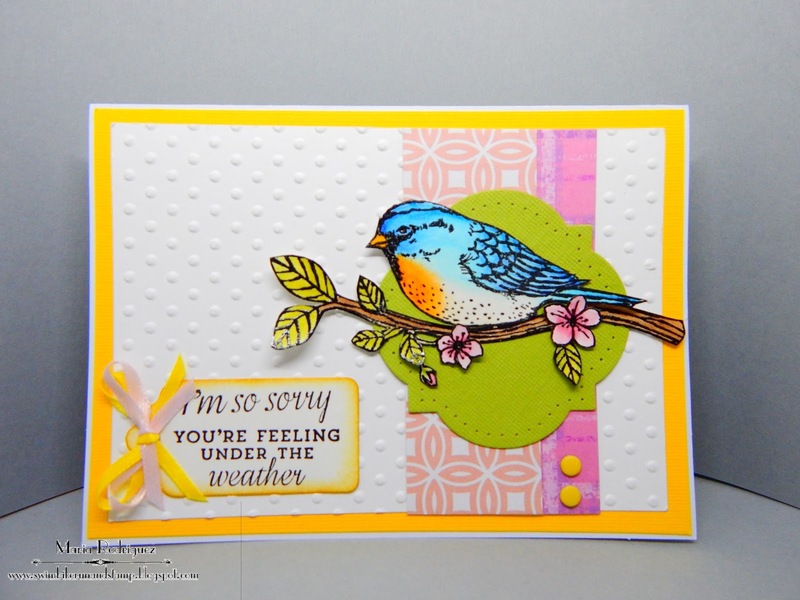 Both sentiments are from the retired Stampin' Up! 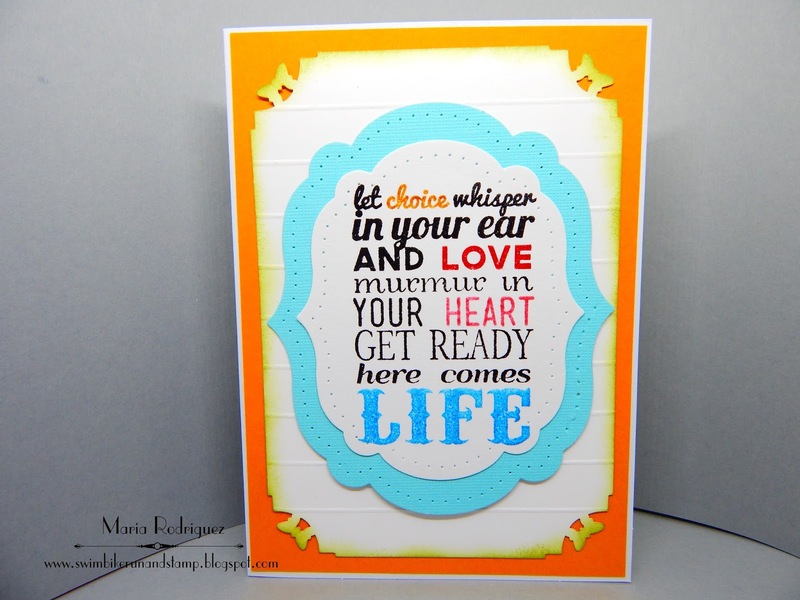 set called "Perfectly Penned", I really love the font on these sentiments. The word SOON is from a sentiment set of unknown origins, LOL!! 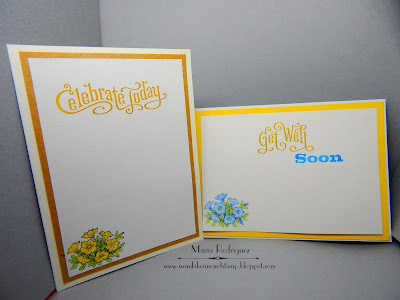 it's very old but I really like the different fonts and sentiments for any occasion. The little bouquets of flowers are from a retired Flourishes set called "From the Garden". As You See It Challenge, I used the sketch on the card with the bluebird. 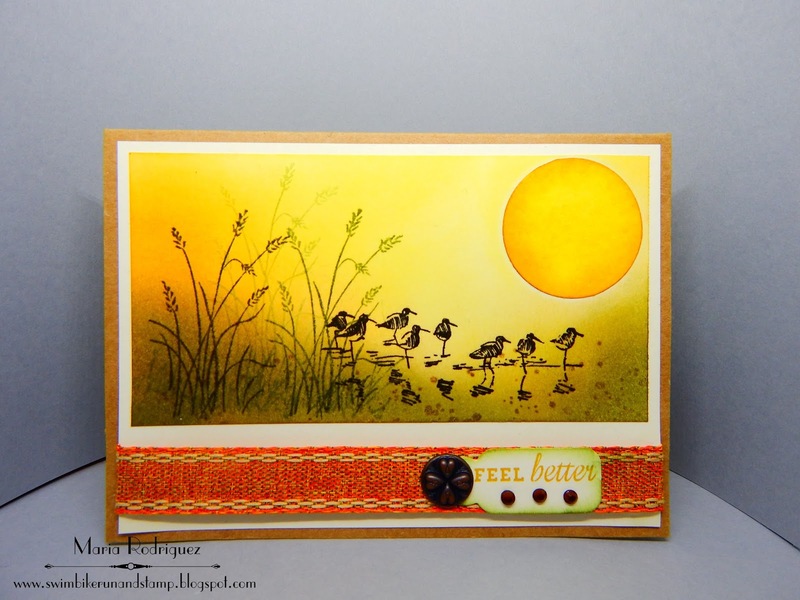 Crazy 4 Challenges #417 "Celebrate Rubber Ducky Day", (any feathered friend will do if you don't have a ducky stamp. 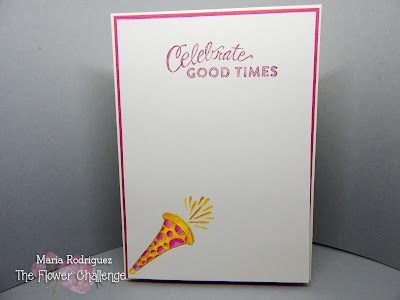 Allsorts Challenge week #450 "No Pattern Papers"
Challenge Up Your Life Challenge #82 "Embossing Folders"